Freshly installed at Brixton’s ‘Pop’ market, Halo Burger is ready to ease even committed carnivores into Veganuary realness with a mouth-watering menu that majors in the sort of juicy, satisfying flavours and textures that many of us miss, even years after ditching the meat. 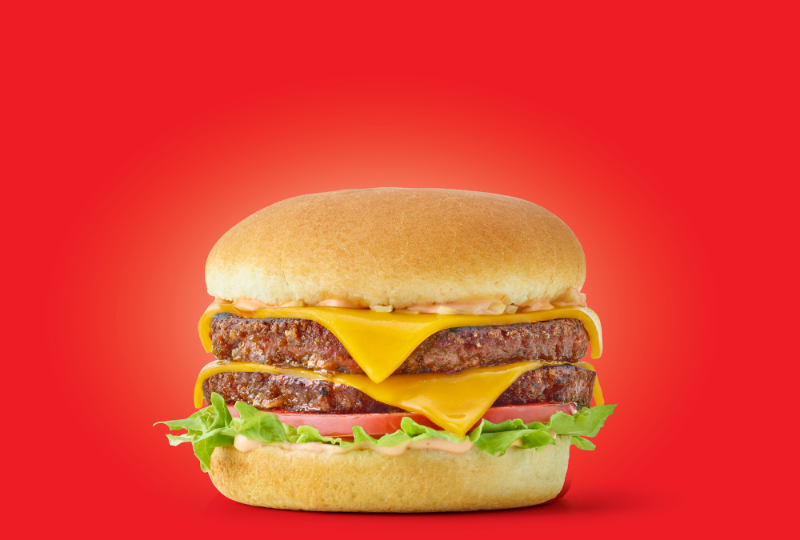 And with vegan cheese that really melts oozing from the bun, you won’t miss the dairy either. Diners are greeted by a vintage boombox belting out 80s and 90s classics, recalling the fave fast food haunts of youth as you enjoy a quarter pounder or Halo Burger; both innovative twists on the fabled Beyond Burger, along with a portion of fries that are positively unputdownable: owner Ross Forder tells me he sampled over a dozen varieties before settling on the perfect crunch-to-fluffiness ratio. 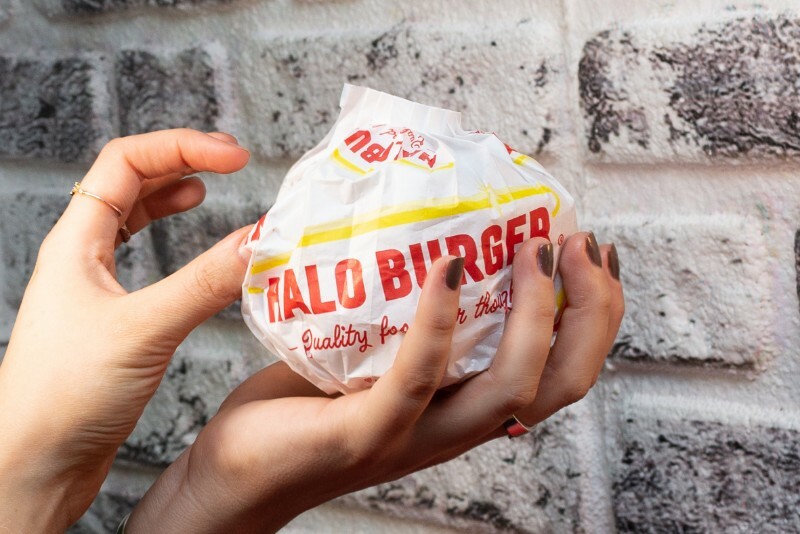 Halo’s packaging also has a nifty non-drip feature that allows the burgers to be eaten on the go with confidence, a triumph of design the messy eaters among us will love. 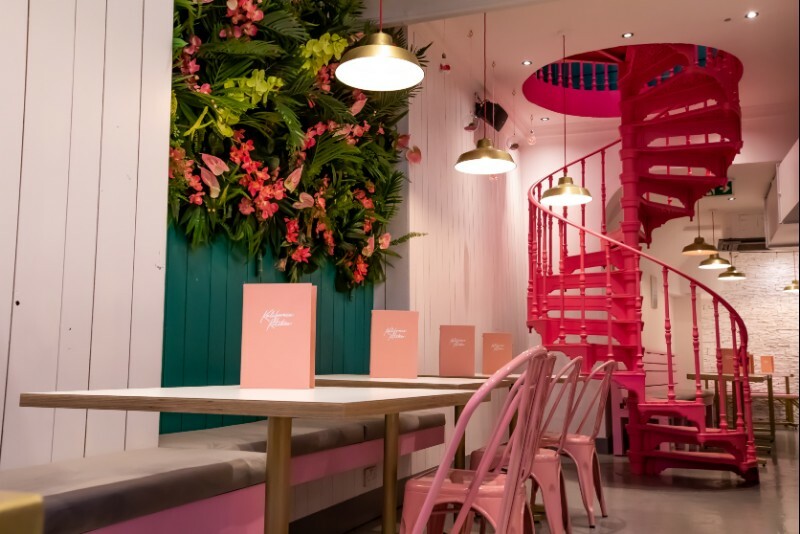 Sitting pretty behind a Barbie pink Percy Street shop front, Kalifornia Kitchen is the latest addition to Fitzrovia’s dining scene and a new player in the plant-based revolution. Founded by vegan influencer and restaurateur Loui Blake, there’s no shortage of tasty material to keep hungry diners and their insta feeds healthy, and in contrast to many of the fast food joints currently coming on to the meat-free circuit, there is an emphasis on health here. But don’t let the h-word put you off: this is decidedly NOT a return to the worthy ways of veggie dining past, and there’s a real playfulness about the place that will put you in a good mood before you’ve even sunk your first CBD latte (yes, that really is a Cannabidiol latte – one of the barista specials on offer) with a pink homemade croissant. 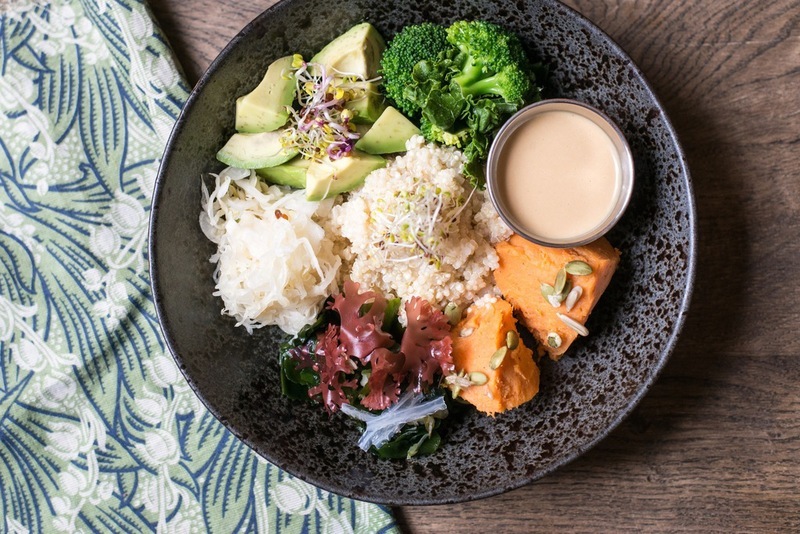 In addition to its health-cred, Kalifornia Kitchen is completely free of single-use plastic, so this really is a guilt-free zone for those looking to turn over a new leaf or two in 2019. Sutton and Sons is a family run chip shop with classic British food at its best. But there’s more than just fish on the menu. After their vegan menu offerings proved such a success, last year they opened a dedicated vegan chippy, just doors away from their existing Hackney spot on Graham Road. Crowned London’s first 100% vegan chip shop, the ‘fish’ is made from banana blossom marinated in seaweed and samphire and then deep fried in batter. It’s truly delicious, with a similar flaky texture to fish. 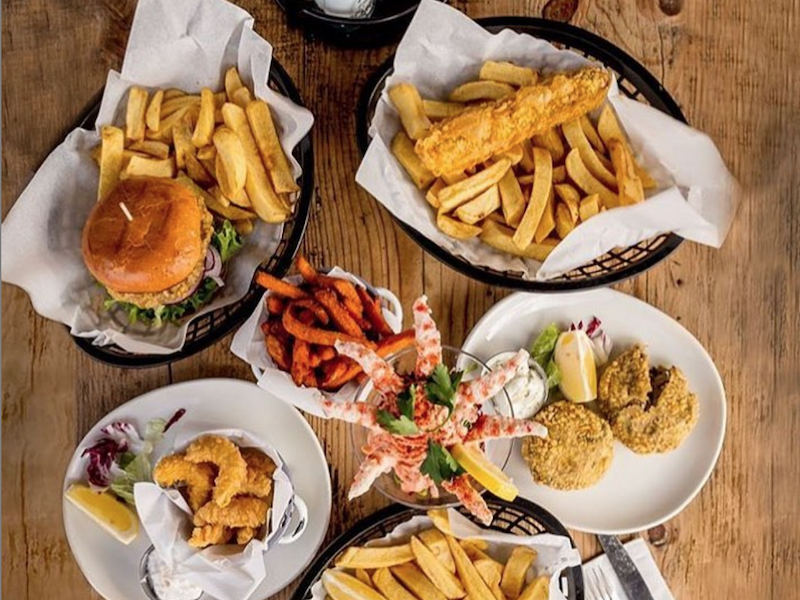 The menu also boasts ‘prawn’ cocktail, ‘scampi (another personal favourite)’, tofish, ‘chicken’ burgers, battered sausages and vegan pie and mash, plus homemade vegan tartare and curry sauce to accompany them. Gourmet vegan fast food at its finest. There is pizza, there is vegan pizza, then there is Death By Pizza’s vegan pizza. Brought to you by pie connoisseurs Young Vegans, Death By Pizza is a 100% vegan Wood Fired Pizzeria in the heart of Hackney. The menu highlights are the Filthy Weekend (‘ham’ and pineapple), Dead Barbie (BBQ ‘chicken’) and the standout Devils Coglioni, a ‘pepperoni’ pizza, with melty mozzarella and a fiery kick. All the vegan cheeses (ricotta and mozzarella) and mock meats (ham and chicken made of seitan) are made from scratch, as well as the sauces and dough. 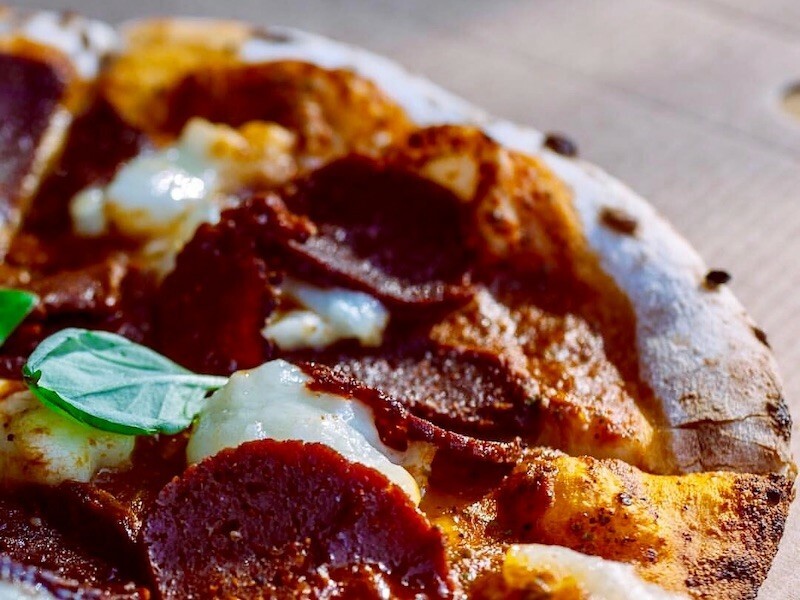 You can catch a slice of the action Thursday to Sunday at their pizza hut at Netil Market or on Deilveroo for the perfect hangover cure. All-day eatery Farmacy welcomes us with open arms, a buzzy atmosphere and friendly service. Foliage strewn and with hues of green at every angle, the cavernous space with central bar is a stylish spot. Owned by Camilla Fayed, the plant-based menu is extensive and inventive, featuring dishes ranging from comforting burgers and curries to nourishing salads and seasonal soups. Start with a syringe shot – we recommend the punchy Fire Starter, a mix of cayenne, ginger, turmeric and lemon – followed by deeply savoury artichoke pizzetta with macadamia ‘cheese’. Then get six of your five a day with their kimchi bowl: a combo of chard, brined and spiralised carrot, spicy fermented cabbage, kohlrabi, radish sprouts, marinated mushrooms, soba noodles and tangy tamarind dressing – light yet filling, and super healthy.